Rolling Blackouts Coastal Fever’s debut album Hope Downs is set to release on June 15, and in anticipation of the album, the band has released the third single and album opener: “An Air Conditioned Man.” Accompanying the track is a lyric video whose perspective rolls through city streets like the viewer is on auto-pilot. The sped-up pace of the video and jostling of the camera emulates a car speeding through a city at night, and gives the video an anxious quality as lyrics like “still in a solid state” slip through. The dizzying turns and flashing city lights become even more chaotic when the legs of pedestrians are spliced into the video halfway through. It is only towards the end of the song that the viewer gains a reprieve; the vehicle drives into a car wash and the soap splashed across the windshield washes out the night, and the song’s urgent sound, heightened by the visuals, somewhat mellows. The video ends with the windshield, and so the audience’s view into the world of the music video, being wiped off, but remaining too blurry to see through. The video for “An Air Conditioned Man” can be viewed below, and the band’s forthcoming album Hope Downs is available for preorder in multiple formats, the details of which can be accessed here. 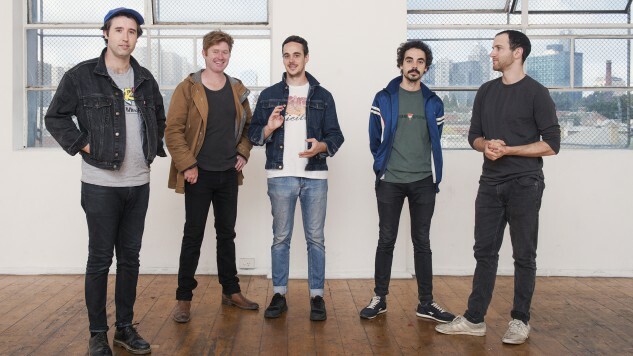 Rolling Blackouts Coastal Fever’s upcoming tour dates are included further down below.